We’ve all been there. It’s almost midnight and you’re still only halfway through copy-and-pasting all your new content from one platform to another. 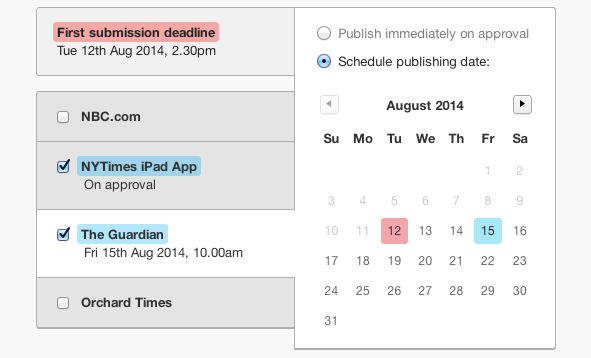 If only you could schedule and publish everything for multiple places in one, easy go. With Camayak, now you can. Since we launched our content API and allowed developers to build their own integrations with Camayak, we’ve had a great response. But newsrooms wanted to approve their assignments for more than one destination at a time. For instance: how about publishing a story instantly to your WordPress website and Tumblr blog, but also selecting it forMonday’s print edition, so your layout team can grab it from the print calendar? Now you can select more than one platform for each assignment and schedule precisely when it should be published on each one. We’re working on integrations with more platforms and would love to hear if you have specific ones you’d like us to consider. Are you using tools that publish to multiple social media accounts at the same time? If so, which ones?